Couldn't resist joining in all the pizza frivolity, it is hands down my favorite bread to make. I was inspired by David's post here http://www.thefreshloaf.com/node/34452/pizza-bliss and Breadsong's post here http://www.thefreshloaf.com/node/34610/was-good-pizza, both takes on Ken Forkish's SD pizza in Flour, Water, Salt, Yeast. 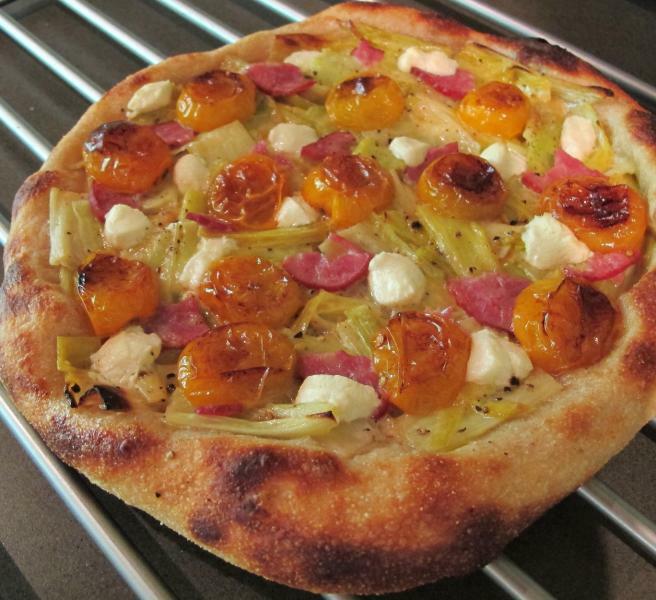 My go-to pizza crust falls somewhere between Forkish's version and a miche made with high-extraction flour. It's a sourdough with a small leaven, high hydration and 20% high extraction flour. After David raved about his pizza made with Caputo 00 flour, I decided to bake off my formula using two different unbleached flours, one was KAF's Italian-style flour with 8.5% protein, and the other was Gold Medal unbleached AP, with about 10-10.5% protein. I left the high extraction flours the same for both, and lowered the hydration to 75% for the lower protein Italian-style flour. I have to say that the Italian-style flour was far superior, baking up with a perfectly crisp exterior and a light, tender and delicious interior. I'm headed up to KAF in a couple of weeks, this bake has me wondering where on earth I could fit a 50lb bag of this stuff, it is that good. If it came in an organic version, I'd be even more thrilled. Yield: Two 12" pizzas, can be doubled easily for 4-5 pizzas. Levain (night before): Mix the levain and allow it to ferment overnight at about 68F. My goal is to have the levain well-risen but not yet ready for another feed- a young levain. In hotter weather my seed: flour ratio is 1:10 and in cooler weather it is 1:2. High Extraction flours: I sift hard red whole wheat flour and whole rye flour through a fine strainer to create high extraction flour, only takes a couple of minutes and it helps to keep the pizza texture light and open-crumbed. Using high-extraction flour also works well with my goal of creating a dough that is full-flavored, rich and complex, but not overly acidic. Autolyse (morning of): Stir main dough flours to combine, add water (85-90F unless room is quite warm) and mix until no dry spots remain. 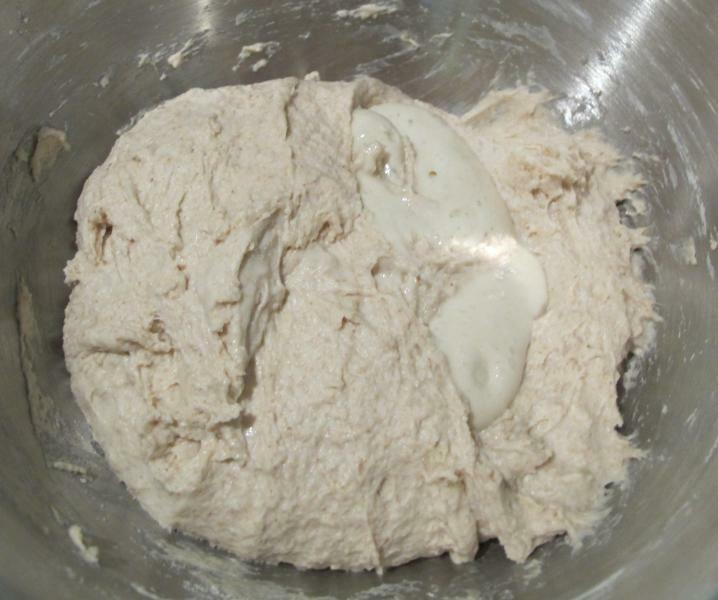 I like to make a well in the dough and add the levain, then draw the sides around to encase it without mixing it in. That way, the different hydration levels begin to equalize and the levain has a nice place to hang out during the autolyse. Autolyse for at least 20 minutes and up to a couple of hours. I autolyse in my folding proofer set at 78F to keep the dough temp from cooling too much before the bulk ferment. Mix the Main Dough: Stir the salt and sugar together in a small bowl and sprinkle over, around and under the dough to coat it all over. This helps keep the high-hydration dough from being too sticky for a short while. Once the salt and sugar are mixed in, the dough becomes quite sticky and stays that way for the rest of the process. 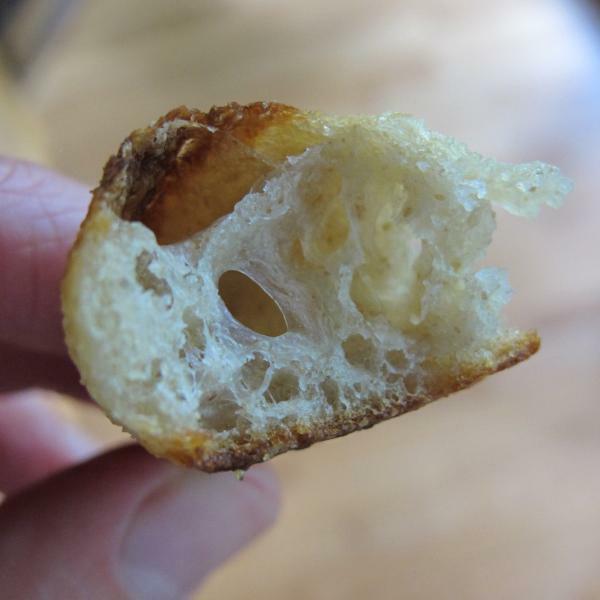 Sugar in the Dough: I don't add sugar to most bread doughs, but after making what seems like a gazillion pizzas over the last several years, I'm thoroughly convinced that sugar really helps create rich flavors and a browned, charred crust in a home oven. It can be omitted and the main dough can be mixed at the same time as the levain and autolysed overnight if desired, but I find that adding the sugar gives the best browning. Bulk Ferment: In my folding proofer set at 78F, the dough takes about five hours to bulk ferment. The version with AP flour needs 3 stretch and folds in the first two hours, and the Italian-style flour version needed 4 stretch and folds. This dough is very wet and sticky, so I leave it in the mixing bowl until the folds are complete, then transfer it to a lightly oiled container to gauge the volume. I like the flavor best at a volume increase of about 2.25x, though it also works just fine at 2x or 2.5x. Dough Balls: Divide as desired and pre-shape into balls. I like to proof them upside down (seam side up) with oil on the pan and coarse semolina on the seam side. During shaping I continue with oil on the tops of the crusts and semolina on the bottom, it helps give the pizzas a softer top crust with a crisp underside. Proofing: The dough balls need to proof another 2 hours at 78F, covered. If the main dough was mixed early in the morning and more time is needed before baking, they can be refrigerated after an hour of proofing. Most of the time I don't refrigerate them. Shaping: I shape just before topping and baking them, being careful not to compress the rim. The Italian style flour version was harder to shape because the dough was both wet and delicate (less gluten), but it was so enjoyable to eat that I didn't mind. Baking: We preheat the oven to 500F+ for an hour with a stone on the middle rack. 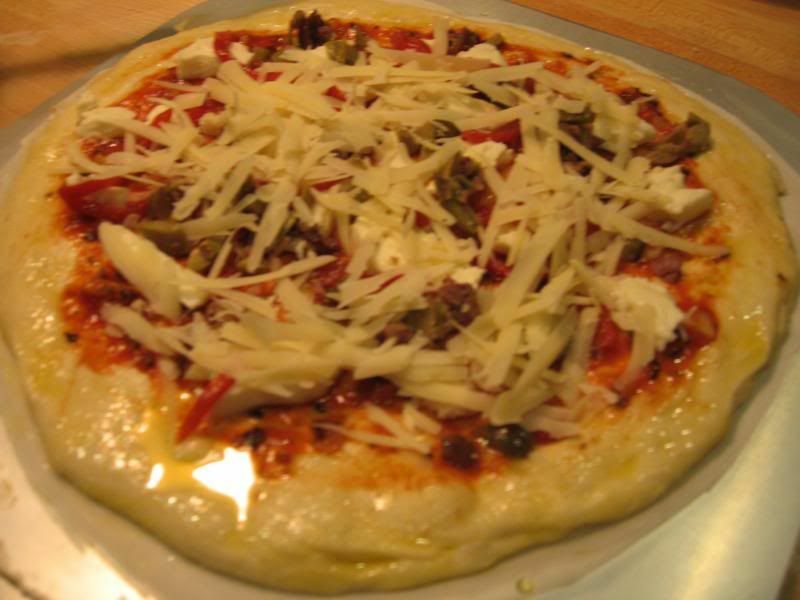 Pizzas take about 5-7 minutes and get turned half way through baking. Toppings: The pizza at the top of this post is a seasonal favorite, it is made with burrata, pan roasted yellow tomaotes, a little parmesano reggiano and fresh basil. If you haven't used yellow tomatoes on pizza before, I recommend giving it a try, they are phenomenal. We like them on pesto pizza, as well as the two versions shown here. The pizza below is a simple goat cheese and basil pizza (my daughter's current favorite), she likes her crust a little paler/softer than the rest of us (braces). The last pizza pictured is a dessert pizza- we don't make dessert pizzas very often because once you've had them for a main course it seems a bit repetitive to have them again for dessert, but it was quite good and fun to try. I brushed the rim with melted butter and used lightly sweetened whipped cream for the "sauce". Then topped that with sliced peaches and blueberries, and sprinkled the whole thing, rim and all, with a tablespoon of sugar. 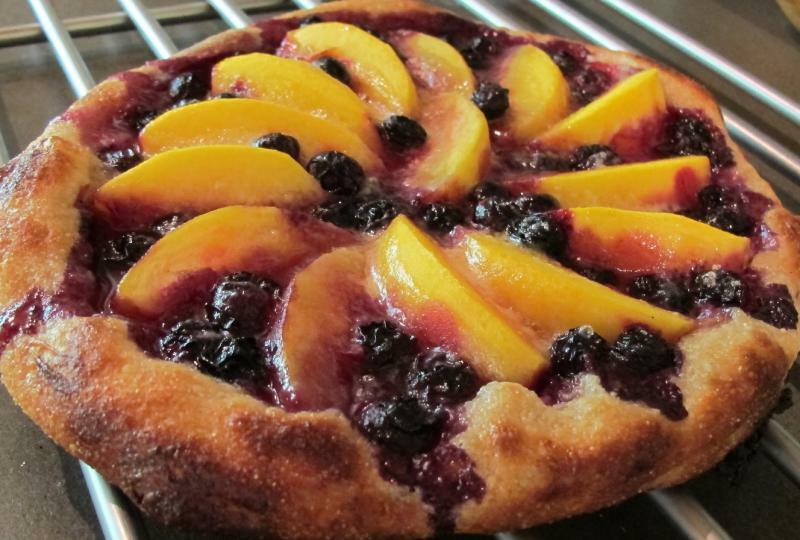 I lowered the oven to 450F so that the fruit would have enough time to bake through. It was delicious. The crusts and topping all look great. Love the dessert pizza too which may come in handy tonight as I have a YW and poolish going for some plantain filled rolls so a little dessert pizza sounds great - won't forget the sugar for that but will ditch it for honey.instead. Well done FlourChild and Happy Baking! Thanks very much for the encouragement, hope your dessert pizza and plantain rolls come out great! All looks fantastic. The sweet pie looks really good. Salty and sweet and crunch and juicy. How could you go wrong. I love your toppings combinations. Thanks for sharing your formula, method and tips. It seems like the low-protein flour does make for puffier, crisper crust. Living were Summer heat makes a big difference in fermentation times, I especially appreciate your solution: Decrease the starter inoculation dramatically. I may give this a try this week. Thank you, David! The photos of the first two whole pizzas (burrata pizza and sausage pizza) plus the second to last (basil-goat cheese) are the lower protein flour pizzas. All the other photos, including the crust crumb interiors, are of the AP flour version. There is a certain pillowiness to rims of the Italian style flour pies. re: starter inoculation, mine is quite small, and I keep it small during the cooler months, too, as it creates a style of pizza that just suits me well. If I need to make a bread in a shorter amount of time, I'll switch to a Hammelman-style larger levain and shorter bulk ferment, but I don't normally do that for pizza. I like the lower acid level of the small levain both from a flavor standpoint and because it is easier to shape a less acidic dough. for pizza! So many delicious combinations. There are organic Italian flours available..Central Milling has a wonderful pizza flour..a local fireman here uses in on his pizza wfo on wheels...just expensive to mail order, for me anyway. Less commercial yeast does do the thick for fermenting longer and freezing..haven't tried it yet with levain. Thanks for sharing all of your beautiful pizza's and formula. Thanks, Sylvia! I love to make pizzas for company, you'd be most welcome :) I will have to look in to organic Italian flours, thanks for the heads up. Lately I have been trying to keep from relying on mail order ingredients, but perhaps I should make an exception. Thank you and good luck if you try this version! If you can't ferment it at 78F be sure to make adjustments to the times- lengthen by several hours for 65-68F, etc. These doughs are quite wet and sticky, if that seems difficult feel free to reduce the water a little, that's what I do when I have a busy day or I'm tired and just want to make life a little easier. The rims will be a little less light and poufy, but still flavorful and delicious. Wow - so many beautiful pizzas! Love the different flours and flavor combinations. It is very interesting to read your process for making these - will try proofing as you do with semolina to see the effect on the crust - certain it's going to be really good! No problem with proofing temps as I am in the South :) It proofed etc beautifully and was a dream to handle. The crust looked great when it came out of the oven but there was a gooey texture to the area where the toppings were....probably due to too much topping and the outer crust , while gorgeous was tough. I have a steel stone and was disappointed in this first use of it. No color at all on the bottom of the crust. It had been in the oven at 500 for a couple hrs while I did all my other bakes so it was plenty hot ! I have always par-baked my crusts too and then topped. Perhaps that is what I will try. Need to get used to how this baking steel works. All the pics and reviews have been so positive so I must have done something wrong. 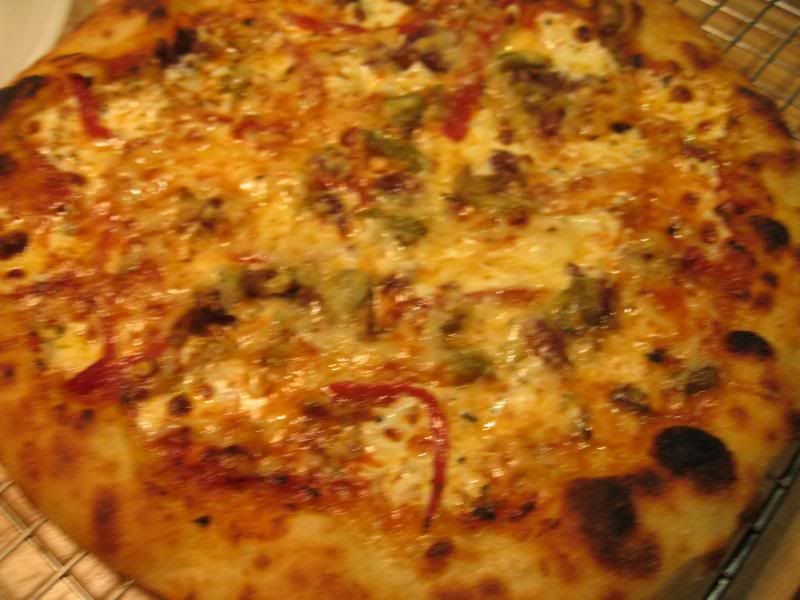 Par baking sounds like a great fix for a pizza with lots of toppings. re: pizza steel, I'm very interested to hear your results, considering getting one of these myself to have a second surface so I can bake more pizzas in one go. Perhaps try moving it lower in the oven- with my set-up, I find that if the top of the pizza isn't browned enough by the time the bottom is done, I move the stone higher. And vice-versa, if the bottom is pale while the top is properly browned, I move it lower. 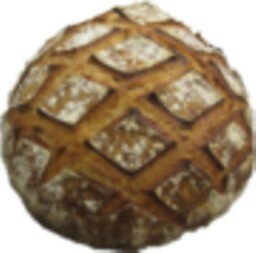 Forkish's formula may also be coming into play, it is very easy with his doughs to overdo fermentation and end up with a crust that doesn't have enough residual sugar to brown well in a home oven. The top looks great, but it sounds like the bottom didn't get brown and crispy enough. That means too much heat from the top and not enough from the bottom, so I'd suggest either lowering the steel and skipping the broiler, or else turning the broiler on for a few minutes with just the steel in the oven, just before baking the pizza. They all look so good Julie, but the dessert pizza is a real showstopper for me, simply gorgeous! I've yet to make a dessert pizza but this one of yours is all the inspiration I'd ever need to put it on my short list of future baking. Great post, and thanks for sharing your formula and method. Franko, thank you very much- it means a lot coming from someone with your skills! The dessert pizza was surprisingly good, like a pie but a little less rich and lighter. The rim- brushed with melted butter and sprinkled with sugar- was the real surprise, it was so good it had me wondering how one might go about adapting this dough to an enriched bread. You're very welcome Julie, I think your dessert pizza looks outstanding! I wondered the same thing re: adapting the dough to something a little richer. I don't think including eggs would be right for this since it would change the dough to something else entirely, but some fat, either butter or a light olive oil at a low percentage (10-20%) along with a sweetener such as honey, maple sugar or syrup, or perhaps agave syrup might be a nice direction to take this dough in. Beautiful pizzas! I usually use 50-50 blend of AP with 00 flour and have gotten great results. I will definitely try the K.F. method next as soon as I order some more 00 flour. Thanks for sharing your inspiring pizzas. Thanks very much, Ian! A 50-50 blend sounds like a great idea, must try that soon. Perhaps it will give me some of the easier shaping of the AP flour and the deliciousness of the 00. Really Authentic looking pizzas, Flourchild! nice work, and healthy too! Thanks very much, Khalid! Plenty of fruits, veggies, and sourdough, plus we always serve pizza with salad, so yes, reasonably healthy. But on the flip side there was also a bit of cream here and there- under the fruit, leeks were braised in wine and cream, and the burrata is mozzarella stuffed with fresh cream.